Buffalo Rising Online recently published an article on development along Ohio Street in Buffalo NY. the site of the Frontier Group of Companies planned Buffalo River Landing mixed-use development. Sep 26, 2015 Posted by Tim Scanlon. You can read the original article here. A rare residential infill project in the Old First Ward is nearly complete. The two-story, two-family dwelling at 440 Ohio Street was built by Burke Homes and appears to have a bit of a nautical theme. 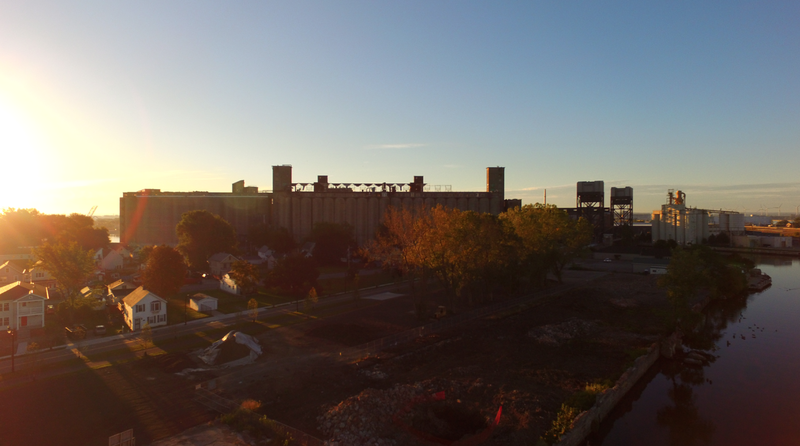 The property is across the street from Buffalo River Landing project (below, left). Sam Savarino and Frontier Group of Companies are expected to commence construction shortly on the project being built on the site of the Erie Freight House. At the north end of Ohio Street, Ellicott Development recently began construction on a five-story structure combining office and 21 upper floor apartments along with a ground floor restaurant (above, right). As a main connector between the Inner and Outer Harbor and with ample Buffalo River frontage, Ohio Street and the Old First Ward appear ripe for investment.